Top 30 Monthly Budget Template Printables: Best List Ever! Looking for a monthly budget template? We’ve rounded up the most brilliant budgeting planners that you can use right away! These planners will help you set your monthly budget and organize your finances so you an be financially wiser this year. They will definitely help you handle your hard-earned income so you can pay off those debts, increase your savings and finally build your investment. Come plan with us! Have you been using a printable budget binder, too? We love how it helps us keep track of our monthly budget. We love how great they work in helping us stay organized! If you’re anything like us who feels eased by having a budget binder handy at home or in office, today’s post is for you! 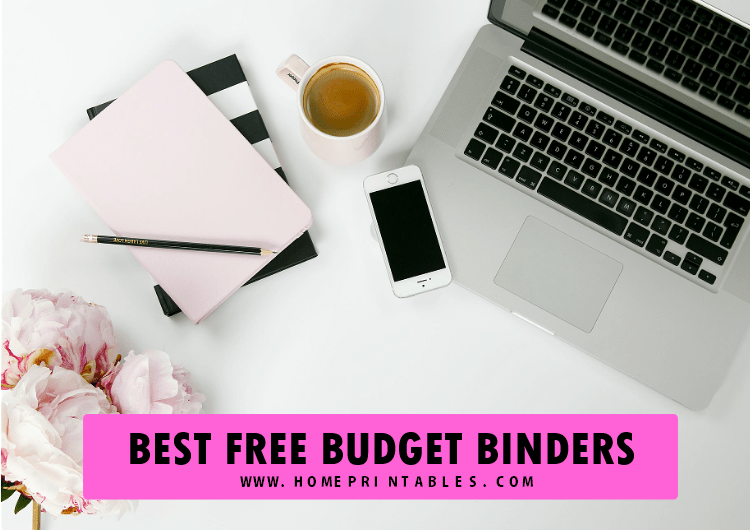 You are about to see our carefully handpicked list of top budgeting printables that are all for free download. We love to use budgeting printables because they give us a simple system to get out finances in order. Ans so today, we thought of gathering the most brilliant ones we have created and found online to ease your search. And yes, we came up with one outstanding list that you can’t miss! Get Your Free Monthly Budget Template Printables Today! Here’s a collection of budget binder printables that includes pages such as bill tracker, savings log, spending log, monthly budget template, debt payoff worksheet and a whole lot more. Ready to view what made or top 30 list of most amazing budget binders? Here they are! Go to the listed links to snag your free binders! Monthly Budget Planner– Includes 30 templates that will help you set your ideal monthly budget by helping you understand your monthly cash flow first. 2019 Budget Planner – A pretty budget planner with 26 printable pages that are designed to help you organize your finances. It includes financial goal-setting sheets that you will surely love to use! Ultimate Budget Binder – This is the most popular budget binder released at Shining Mom blog! This binder includes easy-to-use monthly budget template printables that will help you cut down financial leaks and finally make simple and educated changes in your spending habits. Monthly Budget Binder – Includes important budgeting worksheets such as bills tracker, spending log, savings log, monthly cash flow and more! You’ll love the 15 pretty planning pages included in this binder. 2019 Budget Binder– This is most popular budgeting binder created by Home Printables. It comes in refreshing floral theme with pretty and easy to use budgeting worksheets. Check it out! Meal Planner Budget Binder– If you’re looking at finally budgeting your expenses in your kitchen this nifty budget planner can help! t’s the kind that lets you plan your menu on a budget. Monthly Bill Payment Organizer– This includes templates and worksheets that will help you sort out your monthly bills and other payables such as credit cards and personal loans. Bill Payment Log– Another set of bill payment trackers with clean and easy-to-use templates. Great to use to help you zero your credit card debts. Christmas Budget Planner– If you feel that you’ve been spending too much for the unnecessary during Christmastime, perhaps it’s time to finally look into your Christmas spending. This free budget planner will help you manage your Christmas budget so you can have extra to spend for the more meaningful ones. Christmas Budget Templates – Includes worksheets for your Christmas budgeting needs! Family Budget Planner – This planner will can help make sure that you spend the money you bring home wisely for your whole family to enjoy. Financial Family Budget Planner – This mini budget planner in A5 size includes 28 printable planning pages that you can instantly download and use. Household Budget Worksheets – A collection of 8 printables for your household budgeting needs! Monthly Budget Worksheet– This includes monthly budget template printables that will ease your monthly budgeting. Grocery List Organizer – Plan out your grocery list before hitting the store so you can save on the the unecessaries! Floral Budget Binder– A floral-themed to make budgeting a whole lot prettier! It includes 25+ financial worksheets! Financial Planner – A colorful financial planner with 25 monthly budget template printables to love! Travel Budget Planner – Love travelling? We do, too! Cut off your expenses by budgeting your travel funds wisely. This planner can help! Design a Life You Love Planner: The best 2019 planner with 40 printable pages published at Shining Mom blog! Happy Life Planner: Colorful planning pages that will spark creativity to your daily planning. Also includes budget templates! Design a Life You Love Planner 2019: Our best 2019 planner with over 40 printable pages! Free Printable Planner 2019: A beautiful life planner by Home Printables in refreshing green theme! Fun Life 2019 Planner: A must-print dog-themed planner for pet lovers! Budget Planner– A purple-themed budget planner by Redefining Mom that will help you track your family budget and spending. Editable Budget Worksheets: Colorful budgeting printables that can be fillable created by Printable Crush. That’s about it! I am pretty sure you’ll be able to find that perfect monthly budget template printable you’ve been looking for with these top budget planners that we’ve listed! Thanks for visiting the blog today. See you again soon!